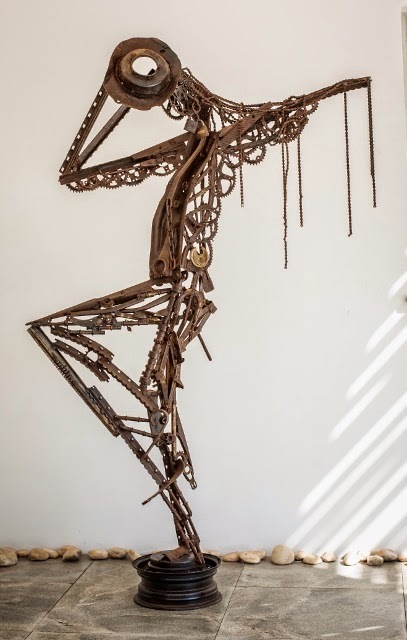 There is something unmistakably kinetic about the work of sculptor Rabson Phiri and it is perhaps no surprise that last year using this energy he took the theme of 37d Gallery’s 2013 upcoming artists exhibition Movemnent-Momentum and made it his own. He shared the stage with five other emerging artists including Mulenga Mulenga, David ‘Doubt’ Makala, Natasha Evans, Tom Phiri and Emmanuel Chibaye in a thoroughly entertaining show, but the theme was almost suited to be an optional title of his featured work Balance, an abstract scrap metal piece of a figure balanced on a unicycle captured in the thrust of motion, which is currently in the Claire Chan collection in Lusaka. But his impressions of velocity do not end with one piece. They can also be seen in works such as The Dancer or Champion to name a couple more. 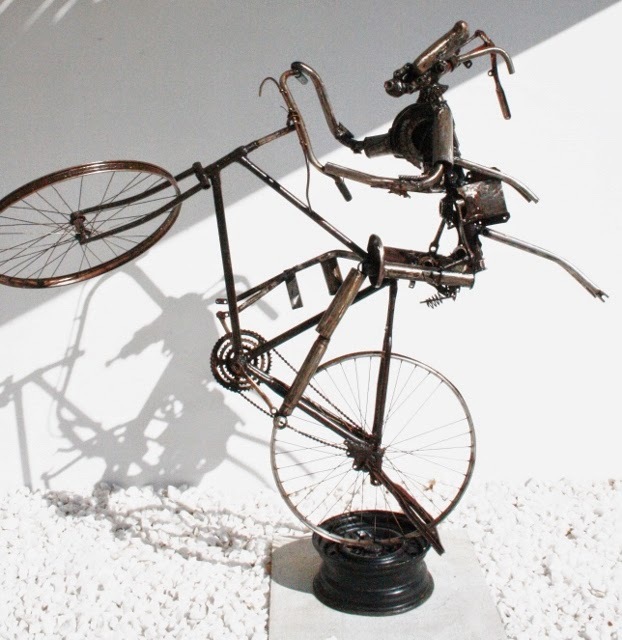 The Dancer features an ingenious usage of scrap metal that comprises mainly car and bicycle parts. According to the artist, this is a reflection of his days as a performer of indigenous Zambian dances while in the culture club during his school days. Champion also pays homage to his past and depicts a cyclist with a raised front wheel performing a wheelie, a considerably challenging acrobatic cycling manoeuvre. In this particular piece he uses the actual frame of a bicycle which gives an indication of the scale of his work which is often life-sized. Champion speaks to two aspects of Phiri’s past. First, the title itself was his nickname in Linda, the Lusaka slum in which he grew up and where he explains he used to win stunt competitions that involved flying off ramps over nails, spikes and broken glass among other challenges in a home-made adaptation of X Games. Second, the piece speaks to his past as a bicycle repairman, a job he had to take up as a teenager to provide child support after impregnating a childhood sweetheart and dropping out of school after sitting for his grade 9 examinations. It is this occupation that would eventually allow his path to cross that of his mentor, the late Friday Tembo and change his life forever. 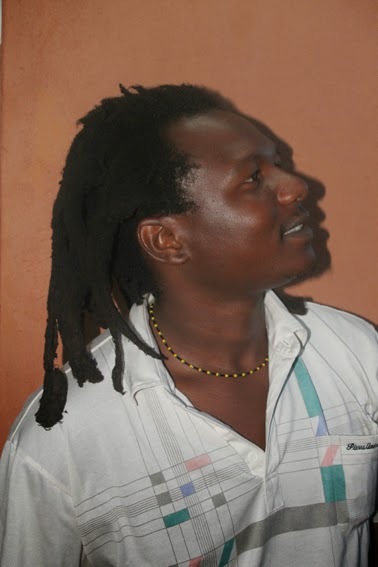 At the time, Tembo had already established Ulendo Studios, an informal art school right in the heart of Linda compound and although Phiri knew exactly where it was and what activities transpired there, he had never set foot there. The opportunity came one fateful day in 1998 when Tembo’s bicycle broke down. 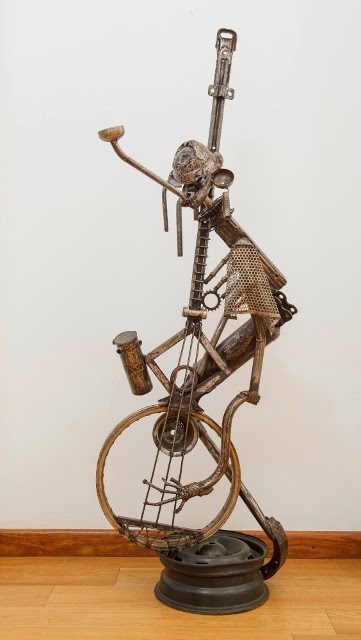 Phiri says the bicycle was very crucial to Tembo because it is the only thing that enabled him to commute between his two wives and leave ample time for studio work and this is one of the reasons he was offered apprenticeship. A day after Phiri accepted to join Ulendo, the excited 16-year-old accompanied Tembo alongside others on an expedition to reclaim discarded wood for use at the studio; the learning process had already started. “He used to explain the (creative) processes to us and he taught us how to use power tools as well, how to handle hard woods, and just how to have an eye for recycling materials and re-using them for art,” he says. At times they never had to go too far to find some of their favourite materials. Ebony for instance is a hard wood that was preferably used as supports for pit latrines because of its non-corrosive qualities, when the residents of Linda began the transformation of their sewer systems to septic tanks; they did away with the old wood preferring brick and concrete. Tembo and team would happily harvest this wood and turn it into fabulous sculptures that would find themselves in the city’s top art exhibitions. A fascinating concept if one was to roll it over in the hole of the mind for a moment. Can you imagine a grime-laden piece of wood that had been under a pit-latrine for a decade or so gaining a new lease of life as a highly polished artwork in a high-end hotel, ambassador’s residency or even State House?, priceless. Although Phiri still works in discarded wood as per Ulendo tradition, of late he has taken a liking towards scrap metal just like his mentor, sometimes combining the two materials. Now aged 32, he is happy where his artistic career is heading and he feels everything is going his way at the moment. “Now I’m working full time as an artist, I have no limits about scale or ideas and I’m not really focusing on sales, I’m also thinking of a solo exhibition because I think I have had enough of group exhibitions and I want to be seen,” he says. He no longer has to take up the odd job as a carpenter or mechanic and has currently taken up work space alongside his Ulendo stable mate John Miti at Canadian artist Wendy Doberainer’s studio in Ibex Hill where he has access to a variety of studio and workshop equipment that complement his work. But despite his new space, he always goes back to Linda compound for inspiration and because from that one encounter as a bicycle repairman, he would later become his mentors right hand man. “Rabson please take care of Ulendo and make sure all your brothers continue to work and make art, art will be your future, and with it you cannot suffer and go hungry”, were the words of Tembo while on his deathbed in the University teaching hospital in 2004. Unfortunately most of Phiri’s Ulendo comrades gave up art after the death of their master, taking up real-world jobs as construction workers and carpenters that surely guaranteed one an income at a specific time of the month. But Phiri stood fast and attended Art is Everywhere a recycling workshop in Nigeria the same year unlike his friends you could see that his career as an artist was taking shape. 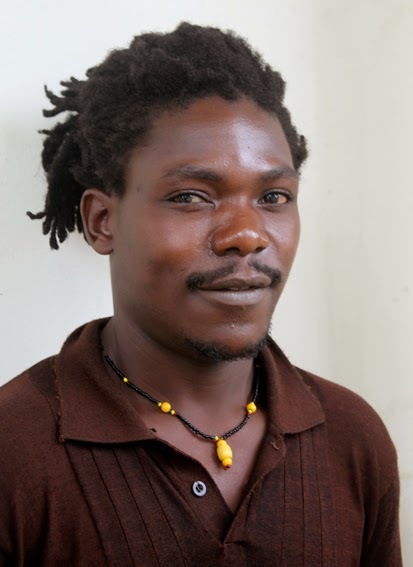 Tragically, his close friend Kalusa – the one responsible for his introduction to Ulendo – was killed the same year. He was stabbed to death in Linda compound over a misunderstanding at a game of pool on Christmas Eve. He does not have an immediate plan on what can be done to bring back Ulendo to its better days but he promises to continue working hard even if it means individually first. 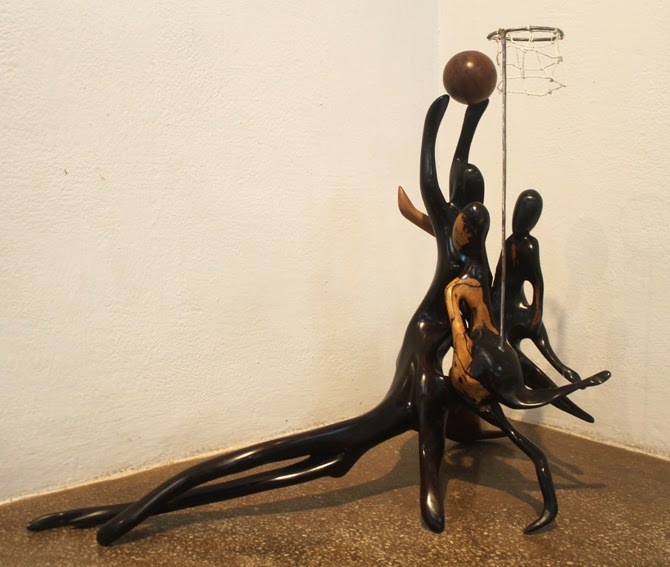 Phiri has exhibited in numerous group shows at the Henry Gallery, the Lusaka National Museum and Twaya Art at the Intercontinental Hotel. He was also awarded the second prize in Sculpture in 2010 for the Art for Wildlife Competition. His work also features in the stART Foundation’s ongoing exhibition at 37d Gallery from where he has enjoyed sales to the likes of energy giants Puma Energy Zambia and Shiraz Limbada from the prominent business family. 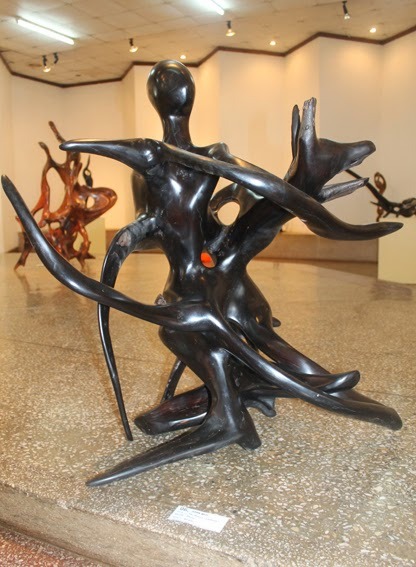 As indicated in a recent edition of the Hole In The Wall, in style, technique and use of material the work of John Miti has not fallen too far from the tree of his mentor, the late celebrated Zambian sculptor Friday Tembo. Truly a chip off the old block, Miti, one of the few active artists from the apprentices of Zambia’s father of reclaimed wood sculpture is determined to carry on the legacy of Tembo’s Ulendo Art Studio. 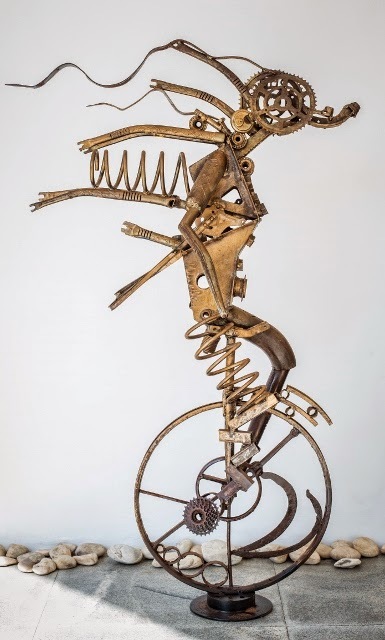 Although he has temporarily shifted base from Ulendo in Linda compound – originally a slum -- taking up studio space with Canadian artist Wendy Dobereiner in Lusaka’s leafy suburb of Ibex Hill, his works still stay true to their origins, a background of art created out of nothing but discarded objects, particularly wood. “I use hard woods; ebony, rosewood, mukwa and musase. But the woods are no longer easily available because of construction everywhere, there is no bush so we have to go as far as Kafue,” says Miti in a mixture of English and Nyanja, insisting on using the latter to best explain his process and visualization. His work too carries titles that are in both these languages. He says the reason he goes as far as Kafue with hired transport is because he would never cut down a tree for use in his work, they all have to be naturally fallen trees, discarded wood. In his belief it has to be God given. “The ideas for my work are also God given. It’s the way you see the material, the type of wood. Never argue with the material otherwise you can even end up throwing it away after creating a worse piece of rubbish than you found,” he explains. “Sometimes you have to look very long and hard at the piece of wood when you find it on the ground and then you use your imagination. You imagine what you can see in the wood, and if you can’t see anything and it shuts down your brain, leave it for the time being and look at it some other time, maybe a vision will come”. When he speaks, Miti’s tone has an otherworldly ring to it. He confidently speaks as if there are actual living beings in these redundant pieces of wood, which one might add is fascinatingly mysterious. And the synthesis of art and mystery often yields intriguing results. To borrow from western thinkers, is it not René Magritte, the Belgian surrealist whose work tests the onlooker’s view of reality that told us “Art evokes the mystery without which the world would not exist”? And is it not Einstein himself who said “The most beautiful thing we can experience is the mysterious. It is the source of all true art and all science. He to whom this emotion is a stranger, who can no longer pause to wonder and stand rapt in awe, is as good as dead: his eyes are closed” – and that is coming from a scientist the most matter-of-fact type of people there are. In this light, listening to Miti explain how he was able to see animals, sportsmen and hunters in the recent work he showed alongside Dobereiner at the Henry Tayali Gallery makes sense. 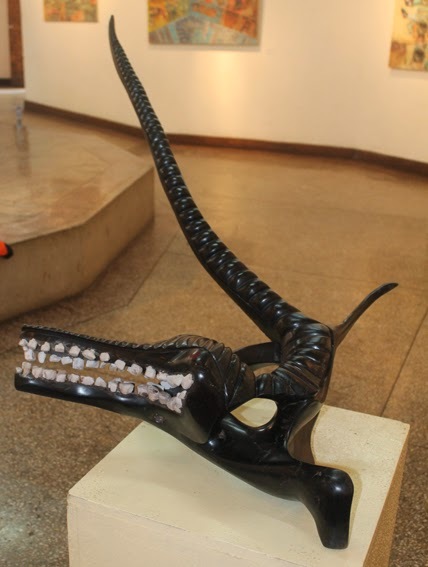 In Hungry Croc - Ngwena Yanjala the artist saw an aggressive crocodile in a piece of discarded ebony. He just made the necessary additions of carving grooves into it to mimic the scaly tale and he added a set of marble teeth finishing it off with thorough sanding and heavy polishing which can last up to three weeks to get a desired finish. In Footballer - Masebela Ampila and Playing – masebela he saw ball players in acts of sports and he presents them to us so convincingly that no one has to explain. In the first you can see a lone football player probably about to dribble past an opponent or pass the ball, in the second one you can see a group of either basketball or netball players jostling for the ball at the rim. Miti is clearly gifted with visions for seeing images within the wood before he carves it. But he never forgets to constantly reference his mentor of whom he speaks so fondly although ten years have now lapsed since his passing. “When we were just starting, Friday Tembo would sneak some of our works in exhibitions and we were not even members of the Visual Arts Council, but he was a founder member of the Henry Tayali Gallery so he did what he could do”, he reminisces. He says the years following Tembo’s death were hard. Miti and close friend Rabson Phiri (read about him next week) had to hustle through all sorts of alternative jobs such as brick-laying and carpentry, returning to art only once in a while. The lads would occasionally receive hand-outs from patrons such as Enzio Rossi, Cynthia Zukas and William Miko from Twaya Art Gallery. All the same, Miti is grateful for the new studio space he is now enjoying and promises the world is yet to see his best. His humble beginnings were in Chainda compound, where he was born in 1983. He later relocated to Linda where he met the late Tembo whom he joined as a studio hand in 2002.